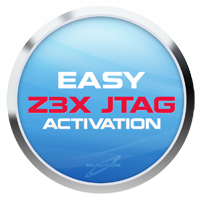 Activation Easy JTAG for Z3X PRO it's additional activation for Easy Z3X PRO interface allow to use Z3x Easy Jtag software. 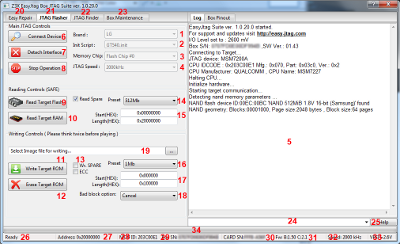 With this activation you can rewrite bootloader or access to memory of chip, unique PinFinder which allows to find JTAG pinout or reconfigure output/input singals. USB 2.0 High Speed Buffered Interface - we use an native USB Stack. Upstream data are directly arrives to box MCU without getting slowed by bottleneck technologies like Prolific or FTDI chips. CDC Stack are give enough performance to match high load pplications. Super Speed Xilinx FPGA Driven Core - Field-programmable gate arrays (FPGAs) are devices that contain programmable logic and interconnects. Incorporating FPGAs into the design of Z3X jtag box ensures that users are able to program or configure boards to erform basic logic gate functions such as AND and/or XOR, as well as, more complex combinational functions such as decoders bus controllers and pinout searching logic. ARM20 Industry Standard JTAG Port - The 20-pin connector is the currently recommended from ARM. You can use different adaptes and jigs , available on market without need soldering or paying for additional converters Connector type: 20-way IDC male eader, 0.1” pitch. Use any 20pin Jtag connectors or jics! Easy and Universal! RJ45 MultiPort UFS3/Unibox Capable - Box are equipped with classical RJ45 Unibox connector. You will be surprised You can plug any type of cables UFS and Unibox. Box will automatically reconfigure power and data lines align. Box are configured as standard unibox after powerup and switch mode after starting corresponding software. Easy and Universal.. Integrated ADC and DAC for voltage control - You can flexibly adjust port IO voltage from 1.8 to 30 volt. Also box can easy measure internal and external voltage with high precision. Easy and Flexible! You can monitor VFEF line of your device in realtime to be shure that all powering on before connection. Integrated surge and overvoltage protection - Connection errors ? Bad cables ? What else can break high cost equipment or PC motherboard We integrated two level power control and protection subsystem to protect phone, box and your PC You can be shure that even you plug in box ports an spoon everything will be protected from disaster. Easy and Safe!